In an effort to prepare myself for all the Pilsner-imbibing I will be doing in the Czech Republic, I have been trying many a beer. Here are my favorites so far this summer. 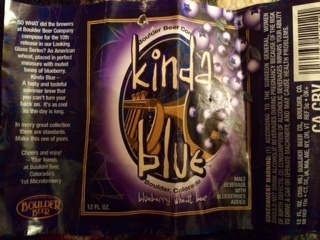 I completely judge a beer by its “cover”- whether the appearance or the name. It’s weird, I’m not much of an explicitly fruity beer person… for example, citrus is often hit or miss with me. And banana, NO. However, I was delightfully surprised at how well they did blueberry. You could taste it, but it was understated and didn’t overpower. Got it at Press 195, Rockville Centre, NY. I totally picked this one cuz of the picture of the hiker. Citrusy, full-bodied, unfiltered. 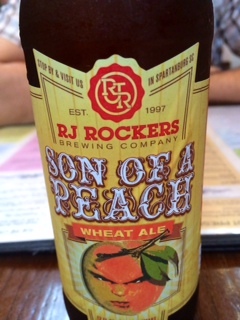 Got it at Trader Joe’s, enjoyed while watching World Cup Final. 3. Radiant Pig Gangster Duck American Red Ale (New York) AND Green Flash Hop Head Red (California). Red ales are a little something different. Both hoppy, the first citrusy, the second caramel. Enjoyed at Sunswick, Astoria, NY. 2. Great South Bay Blonde Ambition (New York): So crisp and light! I feel like I can taste sun when I am drinking this. Very refreshing. Also tried GSB’s Blood Orange– re: what I was saying about the fruit, this was so faithful to the name…but after a few sips I was like, yeah I’m done. With a name like this, how could you not… I have never heard of this before, but it was KNOCKOUT. Defies my fruity aversion. Unfiltered, it tastes equal parts peachy and beery. The absolutely perfect crisp summer beer- drink while outside looking at greenery. Got it at Press 195, Rockville Centre, NY. 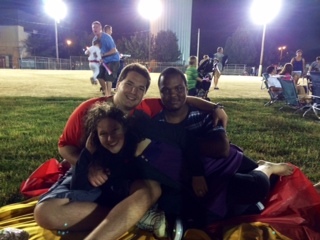 Had a fun weekend. 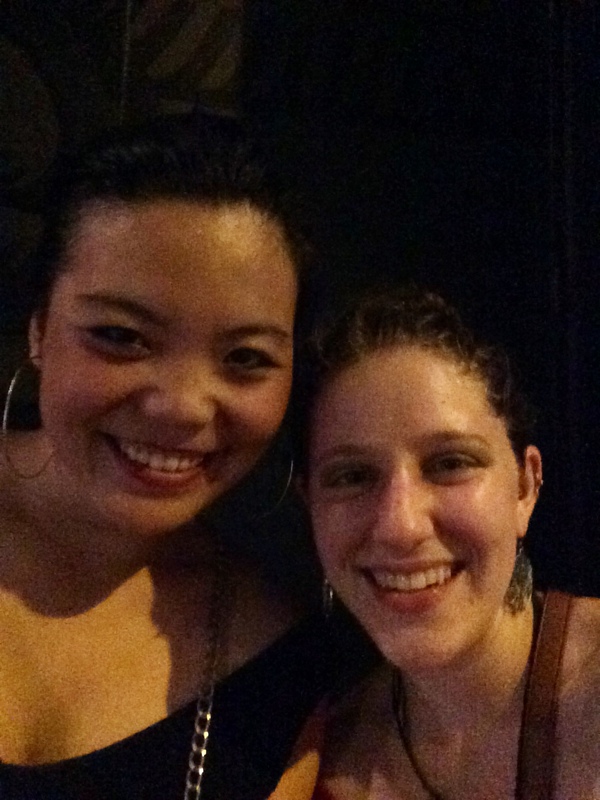 First I hung in Williamsburg with mah girl Shelley and we went dancing at Brooklyn Bowl. 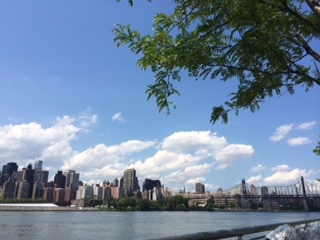 Discovered amazing view of Manhattan in Gantry State Park in Long Island City. 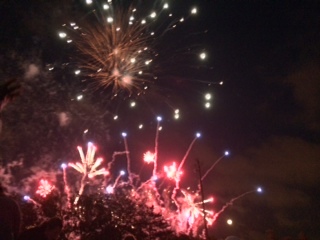 On Saturday, I went to my friend Kevin’s birthday party in Astoria, and to the fireworks at night with Kareem and my old friend Justin, whom one is hard-pressed to pull from his work. I also got my first personal purchase from Etsy, a polymer-clay POMEGRANATE NECKLACE from Nataly and Anatoliy in Ukraine. 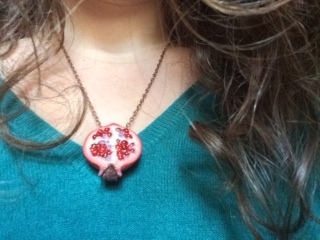 Obsessed and can’t stop wearing it… I wonder what a pomegranate-infused beer would taste like…?